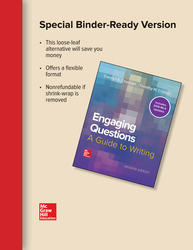 Engaging Questions: A Guide to Writing takes a practical approach to composing, with a view that good writing occurs in the context of critical thinking. 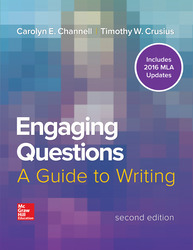 By using a consistent methodology that prompts students to learn and practice "the art of questioning," Engaging Questions presents writing as one essential part of the critical thinking whole, ultimately empowering students to become skilled thinkers and confident writers. Chapters 22-39 are optional chapters available online within McGraw-Hill's Connect platform or for addition to your text, please contact your learning technology representative for additional information. Chapter 27: How Do I Write a Rhetorical Analysis? Chapter 28: How Do I Write a Blog? Chapter 29: How Do I Write a Reflection? Chapter 30: How Do I Write a Visual Analysis? Chapter 31: How Do I Write a Review? Chapter 32: How Do I Write an Editorial or Opinion Column? Chapter 33: How Do I Write a Proposal? Chapter 34: How Do I Write a Research Proposal? Chapter 35: How Do I Write an Annotated Bibliography? Chapter 36: How Do I Write a Prospectus? Chapter 37: How Do I Write a Lab Report? Chapter 38: How Do I Write Instructions? Chapter 39: How Do I Write an Abstract?